· Virus or Malware infection in OST file. · Improper shutdown of Outlook during OST and Exchange Server synchronization. · Accidental delete of Exchange mailbox. Earlier versions of MS Outlook comes with a Scanost.exe to resolve errors with offline Outlook Data File (.ost file). But Scanost.exe tool is no longer available from Microsoft Outlook 2010. 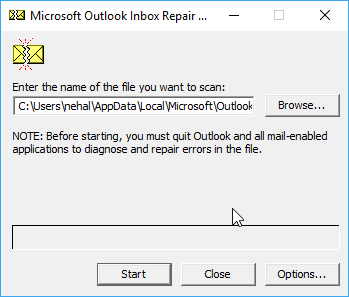 In MS Outlook 2013 & 2016 you can use SCANPST (Inbox Repair Tool) to scan and repair OST or PST file. a. Search and Find the Scanpst.exe Tool in default installation location of MS Office Outlook. b. Run the Inbox Repair Tool then browse and select the corrupted .ost file. c. Click on Start button to start the scanning and finding errors with OST file. d. To start the repair all the found errors click on Repair. The scanpst.exe tool is not capable to repair major errors with OST file in Outlook 2016 & 2013. In some cases recreating a new fresh OST file with the same Outlook profile may fix this Outlook error. Follow the steps down below to creating a new .ost file. a. Close Microsoft Outlook Application. c. Delete the OST file with the error message. d. Open MS Outlook again and you find a new OST file is created. 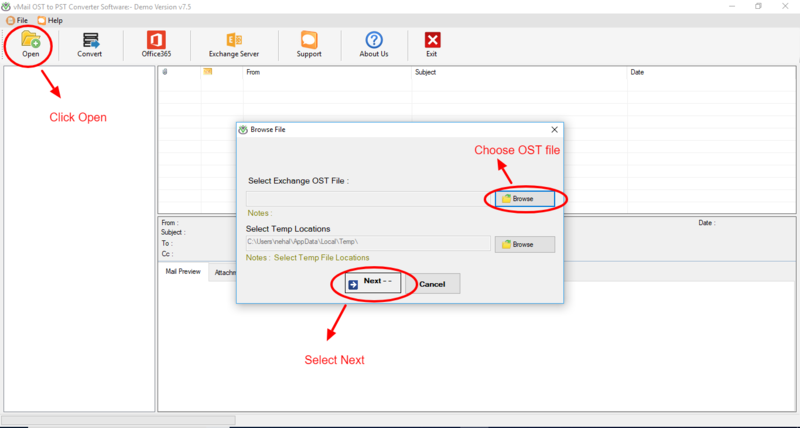 Although this method is very effective, in the worst situation, there is a risk of data loss if OST file is corrupted without synchronizing all data the Exchange Server which works and changes made offline. In some cases, the reason behind the error with OST file could be corruption in the default Outlook Profile. In such rare cases, follow the steps down below to create a new Default Outlook Profile. a. Open Outlook Application and in File Menu Open Account Settings from the Account Information Section. b. 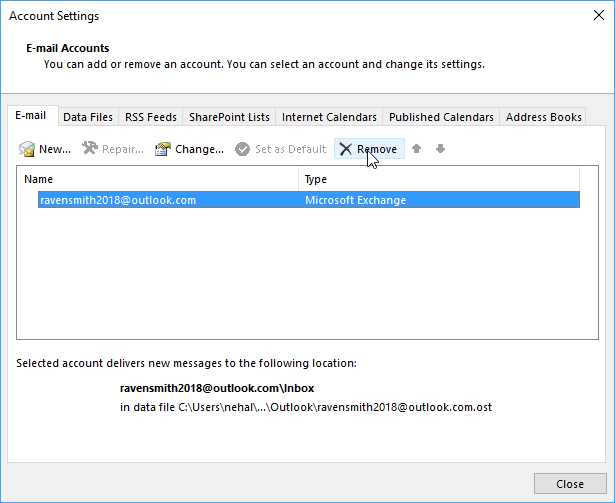 In Account, Setting select the current default Outlook email click on Remove. c. Now Click on New to set up a new email account then choose this account as the default profile. As this error case is very rare and there are chances that this method fails to resolve this error. 4. Repair and recover OST file data and save as PST file. 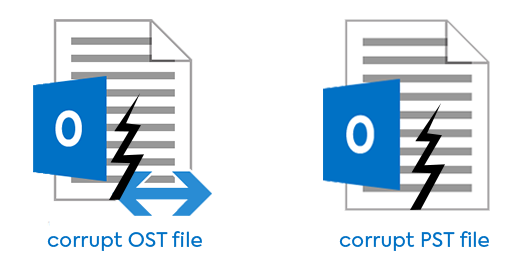 If the above two methods not work, the best solution to recover mailboxes from corrupt OST file in to convert it to PST file, further import PST file in Microsoft Outlook. 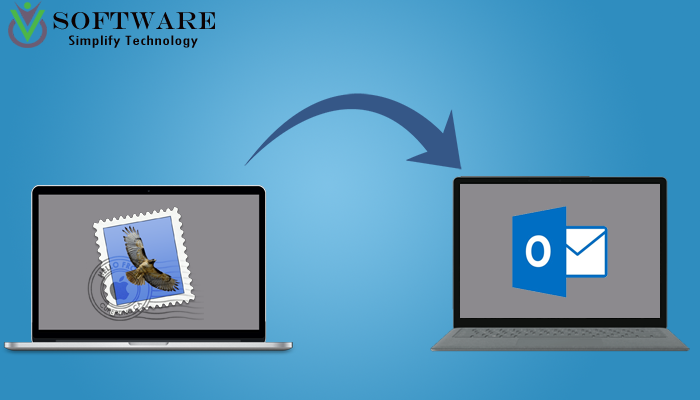 As MS Outlook is not capable to export a corrupt OST file to PST file, then the most recommended method for OST to PST Conversion is use a third-party software vMail OST to PST Converter. This tool can easily convert a corrupt OST file to a healthy PST file. a. Download and Install the vMail OST to PST Converter. b. Run the software and click on the Open option. c. Here browse and select the corrupt Exchange OST file and click on Next. d. Now click on Convert option to open Export Options. e. Browse and select a Folder and choose Save as PST to convert and save all data as PST file. f. Click on Convert Now to start OST to PST Conversion process. 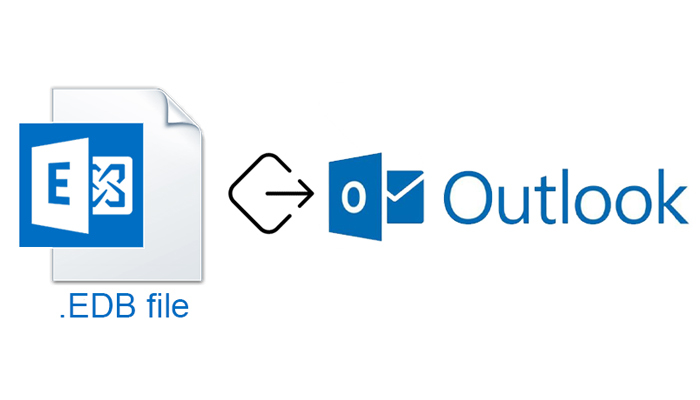 If the first two methods not work while fixing Outlook error with OST file, then vMail OST to PST Converter is capable enough to repair corrupt OST file and save as PST file which makes emails and other data from corrupt OST file accessible in Microsoft Outlook and there is no OST file size limitation while using this tool for OST conversion.